Each week, Big Issues focuses on a newly released comic-book issue of significance. This week, it’s Adventure Time #10. Written by Ryan North (Dinosaur Comics) and drawn by Shelli Paroline (Muppet Snow White) and Braden Lamb (Ice Age: Iced In), this Choose Your Own Adventure issue not only gives readers control, but breaks the fourth wall to make them integral players in the story. Plus: a doomsday backup story by Jon M. Gibson (Brandy And Mr. Whiskers, Maya & Miguel) and Jim Rugg (Street Angel, The Plain Janes). Remember the Choose Your Own Adventure books? Remember the thrill of being able to control the story, and the sense of power that came from being able to change the course of the entire plot? Much of the grown-up appeal of the Cartoon Network series Adventure Time and its attendant comic lies in one simple question: Remember? There are few television shows or comic books that capture the limitless imagination and energy that comes with being a child, and watching an episode or reading an issue as an adult is like stepping into a 10-minute portal to the past, when the world still seemed new and full of possibilities. Adventure Time #10 is all about possibilities, telling an elaborate Choose Your Own Adventure-style story that grows more complex with each page. It’s an incredibly engaging and fun issue, breaking the fourth wall to make the reader an active player. Choose Your Own Adventure-style comics have been tried before, with The Unwritten #17 standing out as a recent example of the storytelling form. That issue was meant to be read while holding the book horizontally, with each page split into two non-chronological chapters of the story that the reader flipped between, ultimately proving to be a bit of an unwieldy reading experience. Writer Ryan North avoids this in Adventure Time #10 by having the separate story tracks appear on the same sequential pages, with multiple plots occurring at once throughout the issue. This allows the reader to follow all the possibilities at the same time, and because most of the choices are also mini-jokes, each page is jam-packed with comedy. What’s made the Adventure Time comic book such a success is that it uses the medium to create an experience that is drastically different from watching the television show. The stories told in the Adventure Time comic book would lose their impact if they were adapted for the screen. In past issues, each page has stood alone as its own gag, turning each issue into a series of chronological comic strips; some pages have added jokes and notes from the writer at the bottom, hidden with off-white coloring. These are things that would be difficult to replicate in animation, but this month’s story would be impossible to adapt into a 10-minute cartoon. This past week, IDW released the first issue of its new My Little Pony: Friendship Is Magic ongoing series, and while it’s enjoyable enough, there’s nothing that distinguishes the comic from the TV show. The character voices are strong and the art is evocative of the cartoon, but there’s no real reason for it to be a comic book. That’s not the case with Adventure Time, which explores the vast opportunities that graphic storytelling presents. 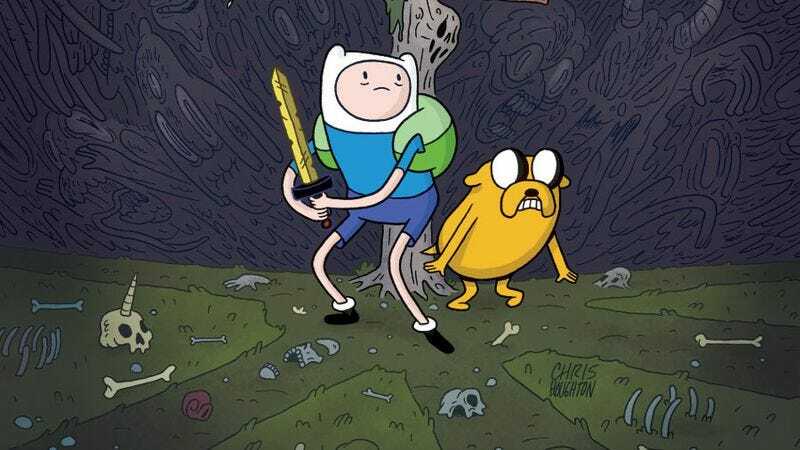 With the power of magic, series antagonist Ice King accidentally puts heroes Finn and Jake under the control of an invisible presence, so the characters know that the reader is manipulating them and are actively trying to cut off the connection. The fourth wall breakage begins when Finn asks the Ice King who is making the choices, and Ice King points straight out to the reader and says, “This person, right here!” The next panel changes the angle to show that he’s pointing at an empty spot where Gunter the penguin has disappeared, abandoning his post as manipulator and giving control to the reader. On the next page, the first choice appears, and it’s a simple one: Do you punch the Ice King? This is one of the book’s signature one-page gags, with both roads ultimately leading to Ice King getting punched, but as the story continues, the plot threads begin to separate. Readers get to choose if they want the Ice King to join Finn and Jake on their adventure, which princess the duo will ask for help, and whether to make Finn and Jake “toot,” decisions that influence the direction of the story. (Yes, farting becomes a fairly important plot point.) By the end of the issue, there are three different tracks appearing on the page, which is when Finn, Jake, Adventure Tim, and Princess Bubblegum realize they can regain control by overloading the reader with choices. The reader can also relinquish control in exchange for Princess Bubblegum’s Royal Princess Toot or to prevent being hit by a counter-curse (“anih cam xesued,” or “deus ex machina” backwards). The three choices converge in a joyous page of Finn, Jake, and sparkle-rainbow-tooting Princess Bubblegum celebrating their victory. Shelli Paroline and Braden Lamb have done remarkable work replicating the Adventure Time style with their crisp, expressive artwork on this series, and this issue showcases their skill for telling a story clearly within increasingly chaotic page layouts. Using different-colored arrows for the story paths not only helps keep the threads straight but has a great visual pop, and when the page layouts become overrun with choices, the color-coding is immensely helpful. There’s fantastic creative chemistry between North, Paroline, and Lamb, and the artists help land each of the script’s jokes with their attention to facial expressions, body language, and environmental details. Add in an uncanny ability to draw jolly farts, and they’re the perfect art team for Adventure Time. Adventure Time has gathered impressive talent for its backup stories, including Paul Pope, Aaron Renier, and Lucy Knisley, giving creators the opportunity to depict the Land of Ooo through their own unique lens. This month, Jon M. Gibson and Jim Rugg tell the tale of Ice King’s Lair Sale, where he accidentally lets Jake push the button on a doomsday device. It’s a cute story with gorgeous artwork done with ball-point pen on ruled loose-leaf paper. Jim Rugg has used ruled paper before on his all-ages illustrations, and it’s a quick and easy way to evoke youth in the artwork, giving the impression that it was drawn in the middle of class by someone who didn’t want to pay attention to the teacher. After Jake pushes the button and brings about the end of the world, the story jumps to Ice Dad, a version of the Ice King who’s telling the story of the Lair Sale to his three children. It’s a quintessential Adventure Time “huh?” ending, cutting the reader off just as the story gets really weird. Fans of the Adventure Time series that aren’t reading the comic book are missing out on some of Finn, Jake, and company’s most entertaining stories, and Adventure Time #10 is a spectacular jumping-on point for readers young and old. Even for non-fans, this issue is one of the most captivating comics of the year.